I appreciate there are probably many better models out there but this is a great price for a decent brand. Reduced from £97.97 on eBuyer but the going rate seems to be about £89 for this model. I nearly purchased from the Hughes Direct eBay store opened for £73 before seeing this. Needs to be purchased with another item to get free delivery for purchase over £50. stupid thing has no kind of kick stand or similar. when in use. while the pic shows it upright, it's only like that when its charging., you actually have to lay it on the floor or prop it up against furniture as you're using it... if you have laminate floors and you try to rest it against a wall or similar,it tends to just keel over or slide down and clatter to the ground as the ball joint that makes it super manoueverable also means it's like propping up a drunk! but well tidy... light and the 2 in 1 element is great. i've never needed it for more than 15 mins at a time so no idea how long the battery would last. no idea if others are better as who goes around collecting them like phones? Actually, the concept translate quite well in use. 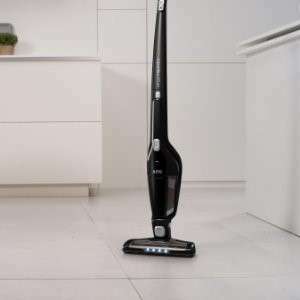 I have a Morphy Richards one I got a couple of years ago from Amazon, and they are great if you have a lot of tiled/laminate flooring. It has a good charging stand, fold down handle. good battery life, and is easier on some occasions than lugging out the main vacuum or my robot vacuum. I agree they are useful as a secondary vacuum, but I seem to spend more time emptying it and unblocking the bristles/airways than using it. Hadn't spotted free delivery over £50! So i've cancelled and re-orderd with the tablet cover, thanks very much! Post also updated. We have similar and the suction is SO poor it’s pointless. You’d prob have to use it for an hour+ to make up for the minutes it would take to get the proper vac from another room and plug it in. Total waste (and ours is a 25V one so meant to be better/stronger but isn’t). We’ve just been to Lidl and saw a similar one £49.99 with 3 years warranty. There’s still a few left. I couldn’t find it on Lidl's website, but I found one on ebay, just for reference. I thought I’d just let you guys know.